Very comfortable and surprisingly excellent virtual surround with a very clear microphone. The earcups are a bit hot after 7 or more hours, and the detachable USB connection cable comes awkwardly configured, which might have been better if the cable connection to the headphones was hardwired, as they tend to wear better and are more sturdy. Whether you're dominating the digital battlefields or just jamming to some tunes while in the park, these headphones have a great sound signature and are righteously affordable. At a sub $100 pricepoint, the value of the headset is absolutely through the roof. The sound quality is akin to what you see in the higher-end gaming headsets but for a fraction of a price. In comparison to other top-tier headphone models, such as the Sennheiser PC355 SE, the Arctis 3 produces sound of the same quality for around one-third of the price. A very clean looking set of headphones: no frills, no RGB lighting, no excessive logo placement, just a more modern take on the classic headphone. Thankfully, SteelSeries saved all of the thrills for the Sound Quality. The microphone mute button is conveniently located on the left earcup, along with a volume control wheel, allowing you to fine tune he volume or mute easily and quickly. The tangle free design of the cable is great and has a nice rubberized finish to it that allows for it to grip the edge of your desk so it doesn't slide around with minor head movements. The microphone extends out of the left earcup and is quite bendable allowing you to position it to exactly where you need to get proper pick up of your voice. Great sound quality, and the virtual surround setting is both immersive and well programmed. Often times with virtual surround you lose some of the clarity and the directional element tends to be indescribable and muddled; neither of those issues plague this headset. Music has crisp highs and mids while still maintaining nice deep lows. The SteelSeries Engine software on PC also allows you to boost that bass for more boom to your explosions or more wub to your dubstep. It also features an equalizer for those who want to really customize the listening experience to the utmost. The Arctis 3 is also extremely comfortable even during 7+ hour sessions of use, and the AirMesh ear cups offer a nice fit and are also extremely comfortable when wearing glasses. The headphones are lightweight and what weight there is to the headset is held up by the tension band that runs along the inside of the top of the band, allowing it to sit elegantly upon your head as though it were placed there by tiny angels. It is almost entirely a hard plastic build, but all of the joint areas feel extremely sturdy and the whole headset feels very solid. Soft touch plastic is used on the outside of the earcups and the inner headband to provide a nice grip for removing them and holding the suspended headband in place once its on your head. The only issue with its construction is the retractable microphone. Typically this arrangement tends to wear out after a thousand or so removal and entries into the earcup with the pliable microphone boom. Hopefully that issue does not appear over long term use. This is where the Arctis 3 really shines: effectively blocking outside noise and providing a crisp, clear sound signature that doesn't clip even when at extremely high volumes or producing a wide range of sounds simultaneously. When you add in the overall Comfort you have a very strong entry in the market for quality budget headphones. These headphones are appropriately sized: the earcups are large and able to cover the entire ear and even form a nice seal with glasses on. They rest on top of your head via SteelSeries tension band design that has been proven over the course of their Siberia line of headphones continually being heralded for its comfort. They are extremely light for their size and even manage to feel incredibly light on your head. 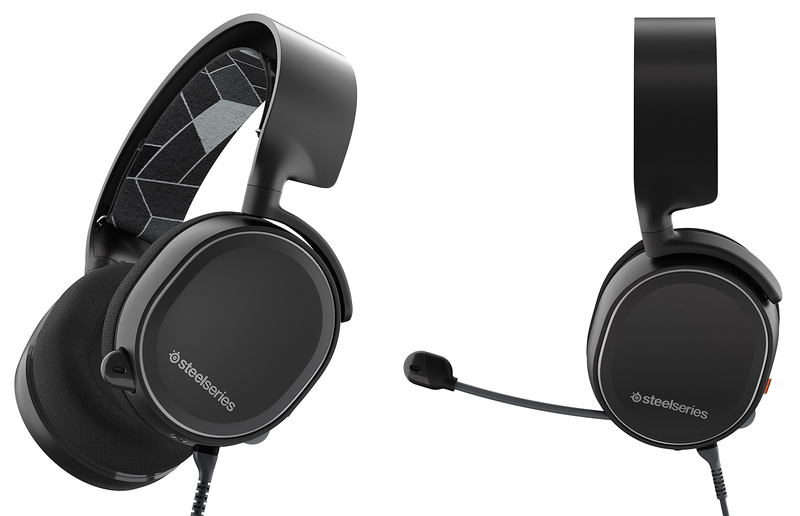 SteelSeries's plan to bridge the gap between the users of headphones for console and PC gaming as well as allowing them to be used for mobile devices is executed masterfully. The Arctis 3 comes packaged with an adapter that will allow you to connect to any of these devices in a snap, quite literally. You simply detach the plug end from the USB cable and snap on the set of inputs desired for your device. Out of the box setup has a minor complication, that being that 2 of the cables are already connected and, if you aren't paying close attention, you might not realize that what you are holding is actually three separate pieces instead of two. The only other setup issue comes in the form of the 7.1 surround activation card. Since the headset is not using USB to connect to the PC or other devices it cannot automatically recognize that the headset is surround capable. Once you have installed the SteelSeries Engine you will be prompted to tell the software what device you have connected and the Arctis 3 is not actually in that list, so you have to create an account with SteelSeries and enter the activation code in order to access the full set of features available.